Jolly Roger Skateboards: We Have Two New JOLLY ROGER - CONCEALED CARRY BAGS in Stock Now! 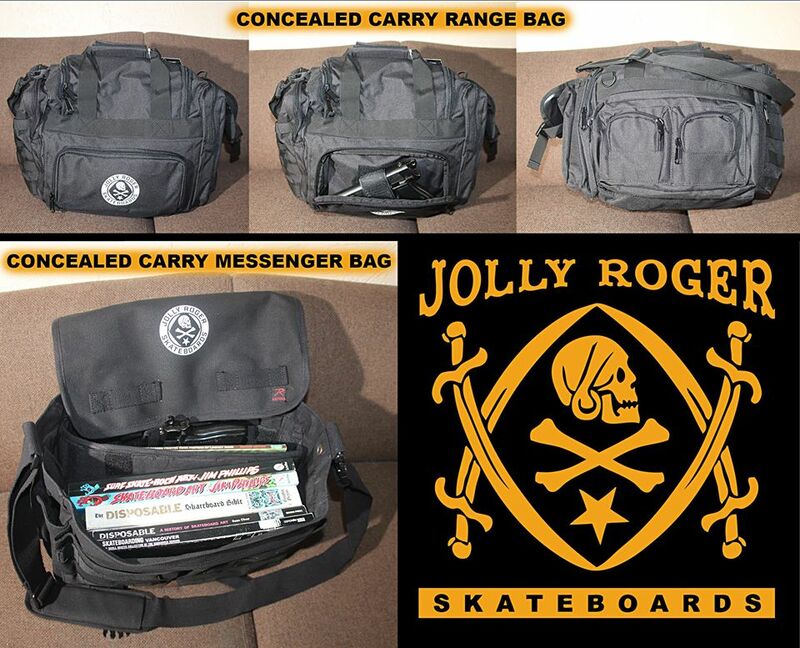 We Have Two New JOLLY ROGER - CONCEALED CARRY BAGS in Stock Now! First up we have our new RANGE BAG that is the ultimate covert tactical bag to take to the range. This bag features: An easy access U shaped zippered flap for quick access to your gear - Zippered concealed carry pouch ideal for handguns - Side zippered pouch with exterior molle attachments - Adjustable shoulder strap and top carry handles - multiple side pouches perfect for ammo, sunglasses, etc. And then we also have our new MESSENGER BAG that is divided into two seperate compartments. The main compartment features a hard insert dividing the concealed carry compartment and the main storage compartment. The concealed carry compartment is fully lined with loop material and comes with a holster panel that can be adjusted in a variety of different angles. The compartment features 2 elastic loops on each side for single magazine storage. The concealed carry messenger bag also features 2 front magnetic closure pockets lined with MOLLE straps on the outside.